NORTH BAY, Ont. 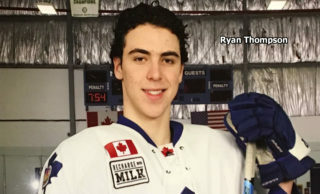 – Bryson Cianfrone scored one goal and added an assist to pace the Mississauga Steelheads to a 3-1 victory over the North Bay Battalion in Ontario Hockey League action Sunday. Jesse Barwell and Brandon Devlin also scored for Mississauga, which improved its won-lost-extended record to 8-9-1 for 17 points, third in the Central Division. Goaltender Spencer Martin made 29 saves. Mike Amadio scored for the Battalion, 10-5-4 for 24 points atop the division after losing a second game in two days. Goaltender Evan Cormier faced 30 shots before a crowd of 3,206. 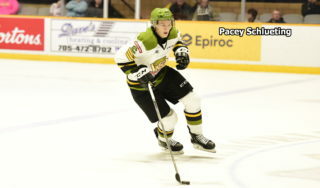 The loss completed a stretch of three games in three days for the Troops, who erupted for a 7-2 home-ice win Friday night over the Peterborough Petes before losing 3-2 to the host Barrie Colts on Saturday night. Rookie Cormier made his fourth appearance of the campaign and the first since Nov. 2, when he allowed four goals on 11 shots before being relieved by Jake Smith in the second period of an eventual 8-5 victory over the visiting Sarnia Sting. Cianfrone opened the scoring at 19:32 of the first period. Defender Miles Liberati coughed up the puck to Josh Burnside in the Battalion goalmouth, and he fed it to Cianfrone at the left post for an easy conversion. 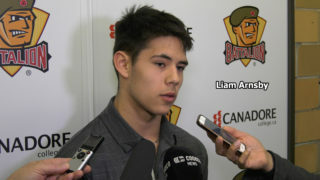 The Battalion, which outshot Mississauga 12-9 in the period, tested Martin several times. His biggest save came in the 18th minute when he got his glove on Alex Henriksson’s shot from the deep slot. Martin also denied a Ray Huether effort from the lip of the crease in the 15th minute and foiled Mike Baird’s attempt at the rebound. Barwell benefited from a flukish play at 18:17 of the second period when he fired the puck from behind the goal line to Cormier’s right and had it deflect off the goaltender’s leg into the net. The Steelheads outshot the Troops 13-10. Cormier stopped Jared Walsh’s right-point shot through traffic in the first minute and turned aside Sam Babintsev’s attempt at the rebound of a Walsh shot in the 13th. 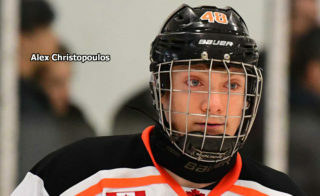 Defenceman Devlin added the final Mississauga goal, his team-leading sixth of the season, 50 seconds into the third period, hammering a Cianfrone feed from the high slot past Cormier, who was screened by Babintsev. After Stefan LeBlanc went off late for checking from behind, the Troops finally solved Martin with Cormier on the bench for a sixth skater. Amadio beat Martin high to the stick side from the right circle at 18:07. 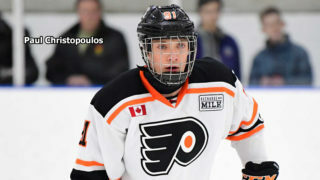 The goal, Amadio’s fifth, was assisted by Nick Paul and Brenden Miller. The Battalion hosts the Sudbury Wolves at 7 p.m. Thursday. BATTALION BULLETS: It was the third meeting this season between the former Peel Region rivals, the Battalion having won 4-3 at Memorial Gardens on Oct. 19 and 3-0 at Mississauga on Oct. 31 … The Troops, who swept the six-game series last year, had won 12 straight meetings with the Steelheads since a 5-4 loss via shootout at Mississauga on Dec. 30, 2012, when the Battalion was based in Brampton. The last regulation-time loss to the Steelheads was a 5-2 setback at Mississauga on Nov. 23, 2012 … The Troops are 6-2-1 within the division … The loss was the Battalion’s first of the season by more than one goal … Cormier, who played in three games last year, suffered his first regulation-time loss and is 1-1-1 this season … Miller has 39 career power-play assists, tied with Raffi Torres for ninth place on the franchise list … The Battalion was 1-for-5 on the power play. 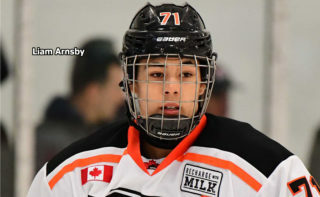 Mississauga went 0-for-3 … Opening line combinations included Paul centring Jared Steege on left wing and Amadio on right wing, Brett McKenzie centring left winger Zach Bratina and right winger Henriksson and Huether skating between left winger Baird and right winger Mathew Santos. Zach Poirier centred left winger David Sherman and right winger Hampus Olsson … The Battalion scratched Kyle Locke, Riley Bruce, Owen Green and Calvin Gomes … The referees were Joe Celestin and Pat Myers.